Officially, older iDevices such as iPhone 3G and iPod touch 2G does not support multitaking of apps due to limitation of slower speed of CPU processor and lesser amount of RAM. Only iPhone HD (4G), which shipped with iPhone OS 4.0, and iPhone 3Gs supports multi-tasking. However, it does not mean that iPhone 3G and iPod touch 2G cannot support multi-tasking after upgrading to iPhone OS 4.0. Instead, the capability has been restricted by Apple entirely on software basis, and can be unlocked by just a simple hack, as found out by iPhone Dev Team. Note: iPhone OS 4.0 is not released for 1st generation iPhone 2G and 1st generation iPod touch 1G. To enable multitasking feature on iPhone 3G and iPod touch 2G, user just has to modify the following lines of code on the iPhone 3G or iPod touch 2G mobile devices upgraded to iPhone OS software version 4.0. In fact, iPhone Dev Team has included the multitasking hack into the iPhone OS 4.0 jailbreak tool so that user does not have to perform the hack manually. The setting to change to enable and turn on multitasking feature on iPhone 3G and iPod touch 2G is “multitasking” directive on the capabilities plist in SpringBoard (SB) app (N82AP.plist), located at (/System/Library/CoreService/SpringBoard.app/N82AP.plist. N82AP.plist is one of the two main files in System Directory. By default, the value is set as “multitasking=false”. 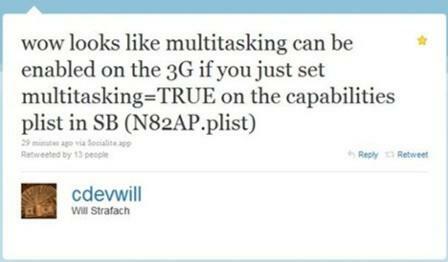 By changing the value to “multitasking=true”, the mult-tasking can be enabled on non-supported devices too. It’s unclear if the iPhone 3G or iPod touch 2G has to be jailbroken before performing the changing of N82AP.plist. One thing for sure though, if you’re going to jailbreak the iPhone or iPod touch, the hack will be automatically performed by most jailbreak tool. 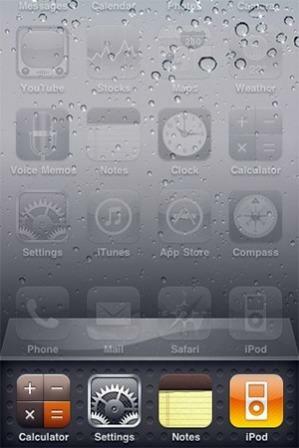 Here’s the video demo of jailbreaken iPhone 3G, with multi-tasking enabled.